Let Someone Else Promote You! I often look at other travel writer’s websites to get ideas on how to improve my writer’s website. And, with a few notable exceptions, I’m constantly amazed at how my peers undersell themselves and their talents. It’s understandable that people have trouble self-promoting - it’s a common problem. There’s an easier and highly effective way to promote yourself and your writing. 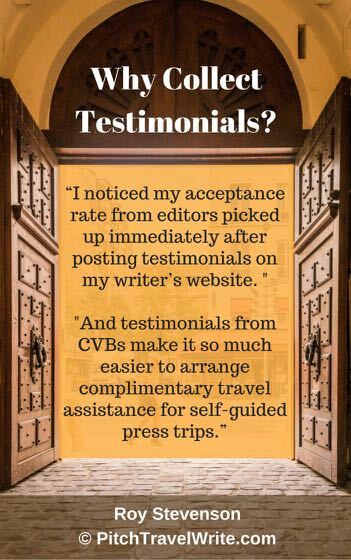 I recommend collecting testimonials from editors and Convention & Visitor’s Bureaus (CVBs), and then publishing them on your website. 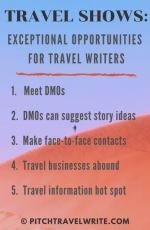 I find this more surprising than writers underselling their talents; many accomplished travel writers don’t even have a writer’s website - a staggering omission! I estimate that 80% - 90% of travel writers out there don’t have a professional website. How can these writers convince a magazine editor of their credibility if they don’t have a website to show off their wares? The beauty of a professional writer’s website is that you can display a portfolio of your travel writing on one site, making it convenient for editors to check out your bona fides. In my opinion, having a writer’s website is no longer optional. These days our customers—magazine editors and destination media reps—instinctively check every writer out online. Despite this necessity, many writers tell me they are embarrassed to put their ‘stuff’ out there. They feel like the places they’ve been published aren’t grand enough. Or, they’re shy and don’t think their travel stories are worthy of public display. Get over it! Your success as a freelancer depends on your ability to market yourself as shamelessly as common decency permits. If you want your work to be taken seriously, you need a website. My professional website has paid off in so many ways, especially when working with editors, CVBs and PR reps who don't know me and want to learn more. 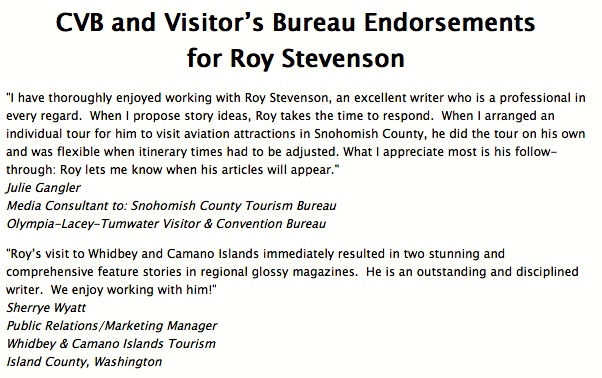 They can find a hefty portfolio and plenty of references on my website, www.roy-stevenson.com. When you send a query letter to a new editor, where’s the first place they look for evidence of your work? The Internet, of course. When you ask media reps at a CVB to arrange complimentary travel assistance for you, where’s the first place they look to find out if you’re a real travel writer, or a wannabee? Yep, the Internet. Providing a writer’s website for Editors and CVBs to learn more out about you is far superior to having random information floating out there in cyberspace. Have you ever tried researching a writer without a website, only to find a vague LinkedIn profiles, a lame Facebook page, and a bunch of other people with the same name? Search results that don’t include a link to your website presents an incoherent view of you and your work. With a professional website, you can create an image of yourself and the writing services that you want editors and CVBs to read. Random information about you will still be “out there”, but magazine editors and CVB media reps will feel relieved when they find a link to a concrete writer’s website. 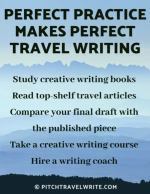 Even if you’re new to the travel writing game, you can create a website with just a few bylines and build on it from there. You’re ready to start a website once you have a handful of bylines. When you apply for a job, your potential employer asks for a list of references. They want to be able to contact people who know you and know your work. For a freelance travel writer, posting testimonials on your website is a way to handle this need. The single biggest gap on the writer’s websites I’ve reviewed, is the complete lack of references, or testimonials. Testimonials are references from people who’ve met you and worked with you. And, for those of you who have difficulty self-promoting, this is a legitimate way to get someone else to write glowing things about you. I’m sure you’ve read testimonials about other people and products. They're interesting and add credibility to whatever you're offering. You’re going on a trip to Billings, Montana and you have requested assistance from the CVB to arrange comps for you. The CVB representative has never met you. So he or she is trying to decide if you’re on the level - and that you’ll produce some great articles for their region. Do you think they’ll be interested in reading about what other CVBs say about you? You bet they’ll be interested! References from other CVBs may make or break their decision to host your trip. When you work with a CVB, their job is to show you the great things about their region, and your job is to show up, ask good questions and write articles about the place. After you’ve done a press trip and delivered on your promise of published articles, it’s time to ask for a reference. On my website, I simply list the comments along with the CVB reps name, title and place. Testimonials are self-explanatory so introductory comments aren't needed. 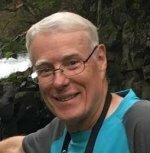 I am currently updating my travel writer’s website <your website URL> and am adding comments from CVBs and Visitor’s Bureaus about how I have worked with them. As I have worked with you this year, and produced several articles for you, I would very much appreciate some brief comments from you. Would you please send me a brief endorsement about how I have worked with your CVB (or Tourism Agency) and successfully published some articles as a result of my Fam tour of your region? The endorsement does not need to be lengthy; a few sentences would be great. This should not take you much time at all. Can you get this to me within the next few days? Thank you in advance for helping with this—it is very much appreciated. I look forward to continuing to pitch stories about (your region) to regional and national magazines, and e-zines. Please keep sending me press releases about new tourism developments in your patch—I’m always looking for a good story. You can use the above sample letter as a template and customize it for your style. If it’s been a while since the press trip, it’s also good to remind them about the articles you produced for them, so add those details, too. And don't forget to thank each person for taking the time to write the testimonial for you. 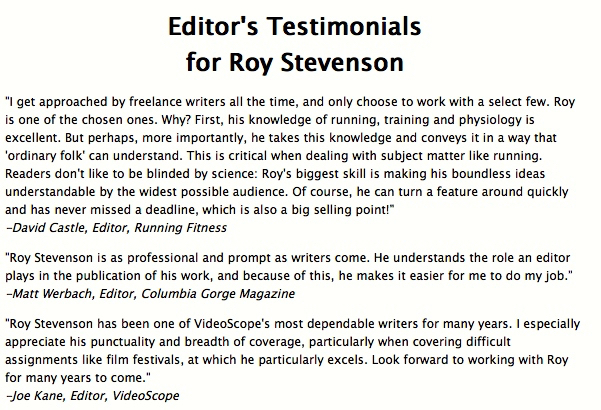 Another section on your website that can open doors with a new editor is one with Testimonials from Editors. 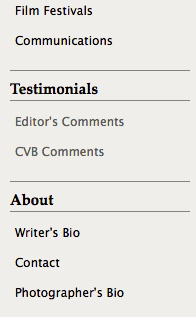 The “Editor’s Comments” section on my website has sealed the deal for many of my query letters to new editors. In this section you want testimonials that show you work well with editors and that you have produced well-written articles. You also want to indicate that you meet deadlines and that your work needs little or no editing. Basically, you want to show that you deliver quality copy and make the editor’s job easy. To get these endorsements, send out a request letter to editors you’ve worked with, similar to the above letter to CVBs. But in this case, you’re requesting them to endorse your travel writing abilities. Of course, you should only approach editors that you have worked with for two or more published articles, and who ‘know’ you and your work. Creating a professional writer’s website is your first step, after you’ve accumulated a few bylines. Then, as your bylines grow and as you venture out on press trips and Fam Tours, and as your stories get published in print and online, you should add ‘CVB Comments’ and ‘Editors Comments’ sections to this website. I noticed that my acceptance rate picked up immediately after posting these two sections. I don’t think it was a coincidence. 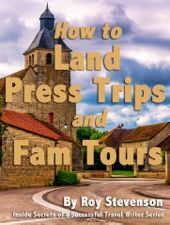 I’ve also found that the testimonials posted on my website make it so much easier to arrange complimentary travel assistance for my self-guided press trips. Media reps read these testimonials, and because you’re showing the name, title and organization that each testimonial came from, there’s an added degree of credibility. And you never know, some people might even call or email your references. It’s a way to get some buzz going about you by simply posting a few testimonials from people who have been kind enough to write one.